I photographed Candase and Tony’s engagement in 2011 & wedding in 2012 – They’ve been around since the beginning! I have had so much fun watching their family grow over the years. They are one of my longest term clients, and I just love them! Photographing the love in their family is easy, and they make some pretty cute kids too. I’m sharing their maternity and newborn session in one post today. April in Ohio is something dreamy. Loved all the gorgeous blooms and that perfect baby bump. 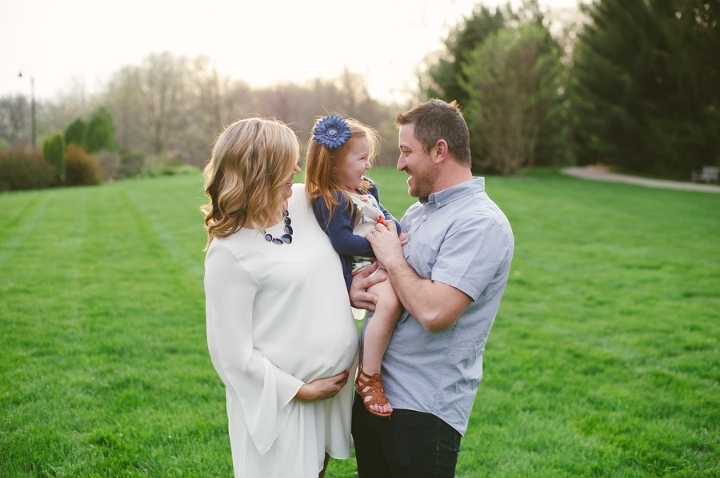 Already excited for the next time I can photograph this sweet family. Hope you are loving life as a family of four! I shot this adorable family’s oldest daughters newborn photos years ago – It has been such a fun ride to follow them along the way! This Fall shoot was almost a year ago now. How does time fly so fast! I absolutely LOVE Fall portraits and will be so sad to miss this years season while I am on maternity leave. This shoot was done in October last year during my favorite time of year. We had tons of fun and I have loved watching their family grow. I had some big plans to blog all of my events from last year before baby — ANNNDDD there’s no way thats happening!! I’ve been so focused on shooting and editing that blogging has dropped pretty low on the priority list. This makes me sad because I LOVE to share all of the amazing weddings and shoots I am able to be a part of every year. I wanted to blog about 30+ events this year and I’ve only gotten done about one per month. Whoops! Turns out growing and preparing for a baby takes a lot more time than I originally thought! I mentioned on my personal blog last month that I will be focusing on more family shoots next year and scaling back on weddings. I LOVE weddings and will definitely still be shooting them! I have 8 so far for 2018 and plan to take a few more. I will miss shooting every weekend but am definitely looking forward to more family time with our little guy in the future! So I wanted to share a family shoot since that will be a larger focus on what I am photographing next year. I shoot typically 75+ families per year and it has always been such a huge love of mine. I don’t get to share a lot of them but hope I can in the coming months! Just a little reminder I am starting my maternity leave October 8th. I am completely booked until then! Still hoping I can do Christmas mini’s but those will not be announced until November once our boy has arrived! Ashley Wallace will be shooting them whether I can or not! Stay tuned in a couple months if you’d like one!! Now, onto this cute family! Happy almost Fall everyone!! I am SOOOO excited about this cool weather and pumpkin everything! Blogging Laura and Matt almost 9 months after their wedding! I’ve never been on top of my blogging the way I’d like to be, but I have to admit pregnancy has made it much worse! Blogging during busy season is something I’ve always struggled to find time to do – and now it’s almost impossible! All my blogging time has turned into snacking and napping. Busted! Editing/shooting and emails always take precedence. BUT – Fall is my absolute FAVORITE time of year – and on this VERY hot day I am missing it big. So, I am super excited to be reliving their perfect day. Laura did everything I would have done for a Fall wedding. Ah, makes my heart sing! I love her dark/rich bouquets, navy suits, bo-ho dresses. I really just can’t get enough of them. There are moments from every wedding I never forget — and what sticks out to me about these two is Matt’s deep love for Laura. He gave an adorable heart-felt toast to all of the guests about how he spent the entire night before the wedding in the ER with kidney stones, but no matter the pain or exhaustion – absolutely nothing would keep him from marrying the love of his life. His words were so genuine (hilarious) and sweet. Life will happen even on days we plan our weddings. But these two handled this hiccup with so much grace and had such an amazing time through it all. I loved spending the day with them and their bridal party. I am still so humbled by every couple that chooses me to document their day. Laura and Matt – so much love for you both! Hope you are enjoying every day of married life! !